"You're doing what I wish I had the courage to do." Three years later, and those words from an old co-worker haven't left me. A week before she uttered them, I had resigned from my six-figure job at a well respected healthcare company. Word had spread that I was leaving to follow my dream of building my own business. Through all the congratulations and well wishes, her words are the ones I've thought of most. I didn't consider myself, or what I was doing courageous. I was only doing what my soul longed to do. And based upon her comment, hers longed to do the same. Ever since then, I've thought a lot about bravery, and what really causes people to leave their comfort zone, in spite of all the risks. It's not that some people are born with a stronger dose of courage than others. 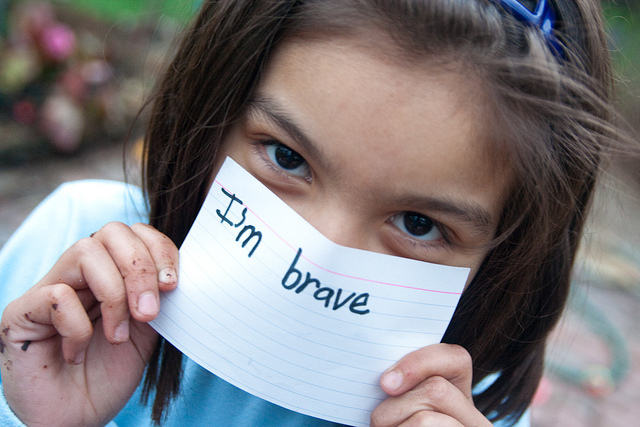 Being brave, is simply about recognizing that you have the power to take action on something. And then of course, following that realization with the appropriate behavior. Being courageous doesn't require you to go out and bungee jump, or be like the heroes you see on the news that risk their lives to save others. You just need to act on what's in your heart to do. Without caring about what others will think. Or fretting endlessly about the possibility of failure. "This went from we can help one girl, to why don't we help more girls. We can work to change the system. And in a crazy moment I decided to try and start an NGO and a school, and worked with people in Kenya and in the U.S. And it's the most gratifying and terrifying thing I've ever done." WISER, the secondary school Dr. Broverman started, now has 120 girls enrolled. The school graduated it's first class of twenty-eight women in 2014. It has also increased the number of girls who complete primary school by 120%. The number of girls that pass the national primary school exam increased by 250% as well. If you are brave, you could change an unjust system. You could help a girl go to school. You could educate others on important issues. Your actions could change the course of someone else's life for the better. "We dreamed of seeing the world with our kids. We imagined having more time to do nothing (and everything) together. We hoped that one day we'd make it happen. And then one day we decided to do it." A little while later, the family of four took a 12-month long around-the-world trip that spanned six continents, and twenty-nine countries. To make their dream their reality, the family made a plan in advance. They saved vigorously. Heather's husband made arrangements to take a year-long sabbatical from his job, and the kids missed a year of school. The Davis' noted they weren't rich, and often felt like they couldn't afford such a trip. In the end, they decided they couldn't afford not to do it. If you are brave, your dream could be your reality. You could quit a job you hate. You could get paid to do work you love. You could visit that place you've always wanted to go. Your actions could change the course of your life for the better. This guy danced his heart out at the 2009 Sasquatch Music Festival. He didn't care what he looked like. He didn't care who was watching. He didn't care who was or wasn't dancing with him. He let his body be free enough to respond in the way the music moved him. Soon enough, he inspired a mob of people to start dancing. He started a movement. That's how movements often begin. Not always with a grand plan for how to make "it" happen. Just with one person shining their light so bright, that it gives others the spark they need to do the same. If you are brave, you could inspire others. You could cause a chain reaction of random acts of kindness. You could provide the encouragement others need to do what's in their hearts to do. Your actions could bring joy to you and those all around you. In the classic The Wizard of Oz, the Cowardly Lion searched long and hard for the courage he later realized he'd had all along. And just like the Cowardly Lion, and my former co-worker, you have all the courage you need right now. You only have to activate it. You already are brave. And as a result, you have the power to do great things, just like the people mentioned above. You don't have to wait for the perfect circumstances. You don't have to wait for permission. You don't have to wait for conventional wisdom to fall in line with your heart's desire. Take action on what your soul wants you to do. Someone is waiting for you to stand up and be brave. And that someone, just may be you.